SSW moves to their email from on-premises to O365 mailboxes. SSW User Groups - SSW launches 2 new User Groups: Melbourne .NET User Group and the Brisbane Full Stack User Group. SSW China - SSW opens a new office in Hangzhou, China, headed up by Alvin Shen. SSW Brisbane - SSW Brisbane moves into big and beautiful space on Adelaide St, overlooking the Storey Bridge. SSW Melbourne - SSW Melbourne moves into big and beautiful space on Little Bourke St, and can now run events. SSW moves to Dynamics 365. SSW moves to TFS on the cloud. NDC Denmark 2017 - SSW's Angular gurus Adam Stephensen and Duncan Hunter present at NDC Mini Denmark. Ignite AU - 4 SSWers presented at Microsoft Ignite Australia 2017. Angular 2 War Stories – We're Bringing the Front Line to You! The Little Book of Angular 2 - SSW releases the physical book. NDC Sydney - SSW co-organises the first ever NDC Sydney. DDD Sydney - SSW co-organises DDD Sydney. Angular Hack Days in Melbourne - SSW holds the first of many successful Angular Hack Days in Melbourne. New office - SSW opens a new office in Melbourne. SSW releases its second ebook - AngularJS – 5 lessons from the trenches. SSW releases its first ebook - The Visual Studio 2015 Checklist. Microsoft Australia Partner Award - SSW's intensive 9-week developer training course, FireBootCamp, wins the Microsoft Australian Partnership Award (MAPA) for Excellence in Learning. NDC Oslo - Adam Cogan presents What's new in VS 2015, ASP.NET and ALM 2015 at NDC Oslo. MVP Summit - The MVP Global Summit is an exclusive event for MVPs, which as an MVP, Adam Cogan attends yearly in Redmond, Washington. With a large catalogue of technical sessions and a variety of networking opportunities, the MVP Global Summit enables MVPs to connect with other MVPs, build relationships with Microsoft product managers, and provide feedback on Microsoft products and technologies. Scrum F2F - Adam Cogan attended the 22nd Scrum.org F2F Global Trainer Meeting in Redmond, Seattle, where some of the best Scrum minds came together for discussions on the state of Scrum, improving the profession, and the latest developments happening within the Scrum and Scrum.org community. TechEd 2014 - SSW's Adam Cogan and Adam Stephensen presented talks at TechEd Australia Melbourne and TechEd Australia Sydney. Adam Cogan gave 2 presentations by himself and co-presented a third with Adam Stephensen. Australian Computer Society 2014 Conference - Adam Cogan spoke at the Australian Computer Society 2014 Conference in Canberra, delivering a presentation on Shaping Your Career, entitled "12 Rules to Better Code and Successful Projects". DDD Melbourne - SSW employees Ben Cull and Damian Brady each presented at the annual DDD Melbourne, an annual non-profit community event run by developers for developers. SSW held the first of many Xamarin HackDays - Xamarin is very important to all Microsoft developers as it allows us to write a C# app in Visual Studio and publish it to iOS, Android and Win phone8 in one fell swoop. The Hack Day featured presentations from experts, followed by time for the attendees to practice what they’d learnt to make their own apps. After such a successful event, I'm happy to announce that Xamarin HackDays are now coming to Brisbane, Melbourne, and more. Be sure to sign up for the next Xamarin HackDay near you. Introducing the new SSW logo - Adam Cogan attended the 22nd Scrum.org F2F Global Trainer Meeting in Redmond, Seattle, where some of the best Scrum minds came together for discussions on the state of Scrum, improving the profession, and the latest developments happening within the Scrum and Scrum.org community. SSW has been represented and branded by the popular 'swoosh' logo for nearly 20 years, but it was time for our logo to evolve alongside our growing company. We could have started afresh, but we chose to keep the original company colors and the core feel. Therefore the swoosh was kept, as this has become the iconic symbol of SSW. We introduced a set of 4 small squares to the design, each in a varying shade of our corporate colors. The squares also highlight that we mainly work with the Microsoft stack. Adam Cogan attended //build/ - Adam again attended the annual Microsoft //build/ conference, where he was among the first to glimpse all of Microsoft's newest offerings, like the Windows 8.1 preview, the return of the Start Menu, and the latest in Windows phones. The SSW-made Event Cinemas website wins Telerik Sitefinity 2013 "Entertainment Website of the Year" - Recognition is based on creativity, design, user experience, and overall presentation of the website. Facing tough competition, the winning websites were selected through public voting. SSW launches FireBootCamp, a major new training course - SSW added a new feather to its bow when it ran the first ever FireBootCamp, an intensive 9-week training course for .NET developers, who are either new to the field or looking to update their skillset with newest and best technologies and practises. The course was such a success SSW is expanding them to run not just in Australia but internationally as well. Check out FireBootCamp.com to see if there's one near you. MVP Summit - As an MVP, Adam Cogan attended the MVP Global Summit in Bellevue and at Microsoft headquarters in Redmond, Washington. With a large catalogue of technical sessions and a variety of networking opportunities, the MVP Global Summit enables MVPs to connect with other MVPs, build relationships with Microsoft product managers, and provide feedback on Microsoft products and technologies. SharePoint Saturdays - Adam Cogan presented at SharePoint Saturday Brisbane (May) and Sydney (October). SharePoint Saturday Events (SPS Events) are FREE one-day events held in different cities around the world, featuring sessions from influential and respected SharePoint professionals. SSW sponsors SharePoint Conference - We are proud to sponsor and participate in the Australian and New Zealand SharePoint Conference. Adam Cogan was at //Build/ - Build is a 4 day annual conference held at the Microsoft Campus, Redmond. The 2012 conference featured extraordinary presentations such as how to design and build beautiful Windows 8 apps, how to sell your apps in the Windows 8 Store and make money, and much more, delivered by the engineers behind the products and services. What's New in Visual Studio 2012 - Software development continues to make great advances and so does Visual Studio. Come learn about the trends impacting software development and how you can take advantage of them with Visual Studio 2012. This talk provides a brief overview coupled with lots of demos to highlight how Visual Studio 2012 simplifies development, streamlines collaboration for teams, and helps you create apps that your users will love. Visual Studio 2012 helps you turn ideas into software; this session gets you started. SSW is now running on TFS 2012 - As far as we know, SSW is the first company in the world to upgrade to TFS 2012! Know more on Adam's and Damian's (the guy in the hot seat) blogs. Enterprise MVC Apps Courses - The Model View Controller design pattern has been an proven and effective way of structuring applications for more than 30 years. 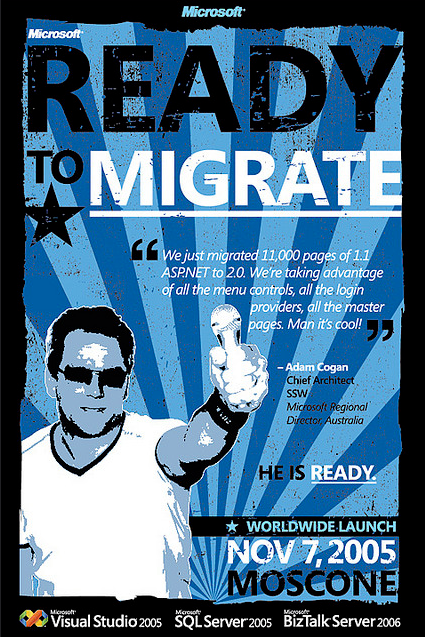 In 2007, Microsoft introduced ASP.NET MVC to the world and since then, the framework has evolved into a mature and powerful way of writing dynamic web sites and powerful web applications. Forsyth Real Estate Interviews - Forsyth Real Estate is a well established Real Estate Company with a history dating back to 1898. We recently produced a series of interviews for them, with top industry experts. Developer Developer Developer Brisbane - Developer Developer Developer (DDD) Brisbane is a community conference aimed at Developers to be held later this year. Speakers for the conference submit topics via the Submit session page and the actual sessions for the event will be decided by delegates voting through the Vote page on the website. SSW was the main sponsor for this event. TechEd Australia - From a keynote hosted by celebrity geek Adam Spencer to a journey into the power of Private Cloud, TechEd 2011 was a massive and enjoyable learning experience. Not to mention a chance to network with like minds and celebrate the many joys of being a geek. As you put the skills and knowledge you gained into practice back at work, just remember, it's only a year until we can do it all again and much, much more. Adam Cogan is speaking at this event. The launch of SSW TV - Each member of SSW has an unquenchable thirst for knowledge when it comes to the latest .NET technologies. SSW TV not only allows us to share with the developer community what we’ve learned, but also guide business leaders and teams towards best practice solutions. The channel includes interviews with technology experts, free webinars, and presentations and demonstrations from some of the most knowledgeable people around the world, making it an invaluable resource for .NET developers of all skill levels. Developer Day Scotland (AKA "DDD Scotland") - Developer Day Scotland (AKA "DDD Scotland") is a community event, run by community for community, which is based upon the highly successful Developer! Developer! Developer! (DDD) community conference events. Scottish Developers is pleased to bring this phenomenal success to Scotland once again. The very best of the UK speaker community will be presenting on the topics delegates wish to see. Aberdeen Microsoft Partner group - The Aberdeen Microsoft Partner (AMP) group meets every two months at the RGU School of Computing in Aberdeen. With over 50 Microsoft Partners in the Aberdeen area we attract around 15-25 regular attendees at each session. For each meeting we always have at least one Microsoft guest speaker and one other external speaker for example in the past we have had presentations from Symantec, Ingram Micro and Jabra. The topics also tend to be varied and can range from technical sessions on Silverlight aimed at developers to the latest in communications and virus software. Australian ALM Conference - This event will explore how Visual Studio and Application Lifecycle Management can reduce costs, reduce development time, increase quality, and improve project manageability. Two full days, 18 sessions and industry leading speakers will arm you with essential knowledge to effectively manage applications through their entire life-cycle from idea, through development, deployment, testing, maintenance, and support. 2010 MVP Global Summit - Microsoft Most Valuable Professionals (MVPs) are invited to attend the 2010 MVP Global Summit at the Hyatt Regency in Bellevue and at Microsoft headquarters in Redmond, Washington, from February 16 through 19. SSW Brain Quest: Team Foundation Server and SharePoint 2010 - Adam Cogan shows the best tools for a project manager to have successful projects and for the developers to have a focused and smooth software development process. Adam Cogan DNRTV talking about TFS and Visual Studio 2010 - DNRTV caught up with Adam Cogan at the PDC in Los Angeles. Adam gives us the 9 steps you need to deliver your product to your customer using TFS and Visual Studio 2010. Carmody Group public website launch - Carmody Group specializes in Hotel Interior Design and Refurbishment services throughout Asia Pacific. SSW was given the task to redesign their public website applying unique design concept to showcase current and past projects. SSW sponsors NZ.NET User Group event - SSW became a sponsor of the SQL Pass Community Connection Event, which was once again run and managed by NZ DNUG Inc Soc with some excellent and unique sessions presented by some of New Zealand's and Australia's most talented and influential experts, including Adam Cogan and Justin King from SSW. Microsoft SharePoint and Office Forum site goes live - Microsoft Australia approached SSW to develop a website in preparation for the upcoming 2008 Forum event for SharePoint and Office. SSW delivered a Web 2.0 site build in SharePoint 2007 in less than 3 weeks. The site capitalizes on many of SharePoint's web publishing features and uses JQuery throughout to enhance the user experience. Virtual Earth was integrated to provide venue information. The completed site demonstrates that the possibilities of using SharePoint 2007 for a public facing website are boundless! The largest public SharePoint site in Australia is up and running. - SSW completed the development of the biggest public facing SharePoint 2007 website in the southern hemisphere for WorleyParsons. The site takes advantage of many of SharePoint's powerful features for managing and rendering content to users. The site is built upon a series of lists and content types that are used to allow simple management of the data. SharePoint web parts were customized, and custom web parts implemented to allow content editors to use content rollup in a variety of ways across the site, for example a summary of news items relating to regions across the world. JQuery was used throughout the site to add more interactivity, such as with the menu navigation. Styles were defined for the site and all content allowing content editors to maintain and add further data without losing the look and feel. Adam shows SSW's SharePoint prowess at the SharePoint User Group - Adam presented his SharePoint - Follow the Yellow Brick Road to Public Web Sites session at the SharePoint User Group. It was a successful night with a good group, and great session. Which firm createdCommonwealth Bank's new Employee Management System? SSW - Commonwealth Bank of Australia (CBA) has chosen SSW to develop a custom Employee Management System to manage the daily activities for thousands of their employees Australia wide. SSW receives a Web 2.0 Makeover - We started the year 2007 by introducing a fresh new look on our homepage. Microsoft banks on Vista - Adam Cogan presents his views on Vista before its 2007 release and the necessary dos and don'ts before installing the operating system. "Microsoft banks on Vista, and so will I". Adam Cogan takes one step further on the Vista release, by commencing internal tests within SSW to provide crucial feedback to his customers. Microsoft Developer Show episode from ThePodcastNetwork.com - In this episode Nick Randolph This opens in a new tab interviewed Adam Cogan and Athena Pawlowski and provide an insight into why user groups are one of the best forms of developer resources available! DotNetRocks interviews with Adam Cogan - Adam Cogan talked about his rules in an episode of DotNetRocks, a weekly talk show on Microsoft .NET development hosted by Carl Franklin. providers, all the master pages. Man its cool"
Way to go Adam!!! You look like a rockstar!